Renau-Morata, B., Sánchez-Perales, M., Medina, J., Molina, R. V., Corrales, R., Carrillo, L., Fernández-Nohales, P., Marqués, J., Pollmann, S., Vicente-Carbajosa, J., Granell, A. and Nebauer, S. G. (2014). Salinity Assay in Tomato. Bio-protocol 4(16): e1215. DOI: 10.21769/BioProtoc.1215. Tomato is one of the most important horticultural crops worldwide, and is cultivated in semi-arid regions in which soil and groundwater salinity is an increasing limitation to yield. The assessment of the responses of new cultivars to salt and the comparisons among cultivars and wild species are of great interest in tomato breeding. This assay provides a reproducible and reliable method for screening tomato responses to NaCl salinity under hydroponic conditions in growth chambers. 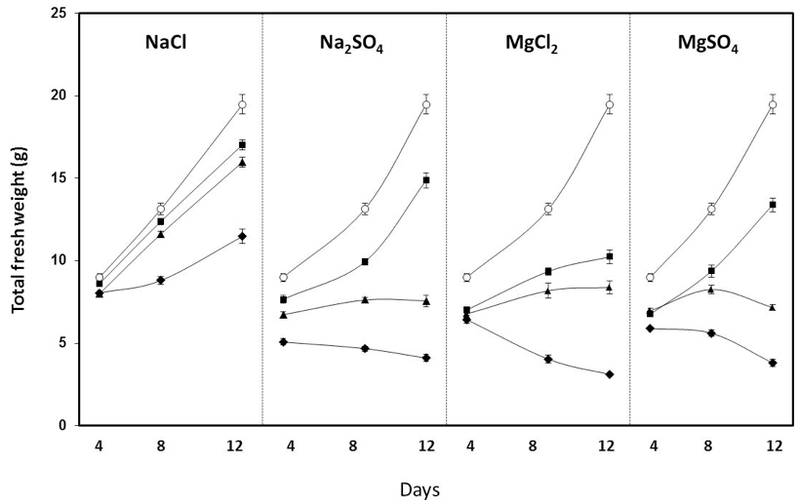 Although NaCl is the most commonly used salt in salinity studies, other salts such as Na2SO4, MgCl2 or MgSO4, usually found in saline soils, can also be assayed (Nebauer et al., 2013). Plants can be maintained for 30-45 days under the described conditions, although significant effects on growth can be observed after 10 days, depending on the salt and concentration used. *Note: These salts are necessary only if they have to be assayed. The standard assay is performed with NaCl. Note: Caps are removed and the tube end is cut with scissors (Figure 1A). Tubes are placed in a tube rack (with a sealed bottom, Figure 1B) and filled with 0.6% agar in tap water (melted in a microwave) using a 50 ml syringe (Figure 1C-D). Figure 1. Preparation of the tubes to hold plantlets. A) Cut tube, B) Racks with a sealed bottom, C) Filling tubes with agar in the rack and D) Tube filled with agar. Polyethylene containers (40 cm long x 30 cm wide x 12 cm high) are used. Covers are bored with a drill to allow the placement of the Eppendorf-type tubes (Figure 2). Seeds are surface-sterilised in a sodium hypochlorite solution (2.5%) with 0.1% Tween 20 for 15 min and subsequently washed three times in sterile distilled water. Seeds are placed in 9 cm-diameter Petri dishes (20-50 seeds per Petri dish) on top of three layers of moistened blotting paper (Figure 3A) and maintained in the dark at 25 °C until germination (3-6 days depending on the genotype) (Figure 3B). Figure 3. Details of seed preparation and germination. A) Seeds in Petri dishes, B) Germinated seeds showing radicle emergence and C) Germinated seeds in Eppendorf-type tubes filled with agar. Place homogenously germinated seeds (3-6 mm root length) in Eppendorf-type tubes with the cut end filled with 0.6% agar (Figure 3C). Moisten the agar surface with a water drop using a Pasteur pipette. The racks holding the tubes are placed in a tray and covered with a humidity dome to maintain high air moisture (Figure 4A). Put some water (50-100 ml) into the tray to guarantee high air humidity within the tray. Maintain plantlets in growth chambers at 25/18 °C in a 16/8 h light/dark photoperiod. Plants (seedlings at fully expanded cotyledon stage, Figure 4B) are progressively exposed to ambient atmosphere by slightly opening (1-2 cm) the humidity dome (Figure 4C) and after one week transferred to containers. Figure 4. Plantlets growing in covered trays. 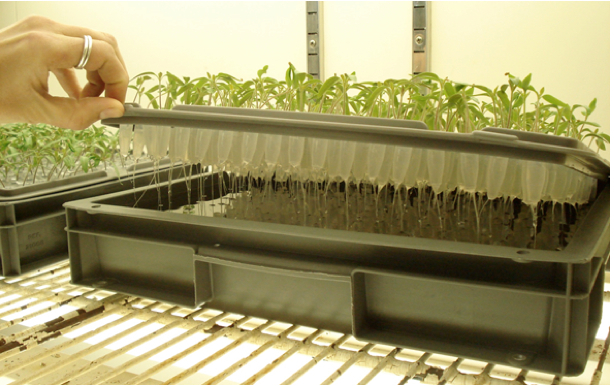 A) Trays with humidity domes for seedling culture, B) Detail of seedlings at fully expanded cotyledon stage and C) Dome opened to allow acclimatisation (indicated by the arrow). Containers are filled with nutrient medium and aerated regularly (for 10 min every half hour with an ‘Aquarium’-type air pump). Nutrient solutions (see Recipes) are renewed every 4 days (the old solution has to be completely removed). 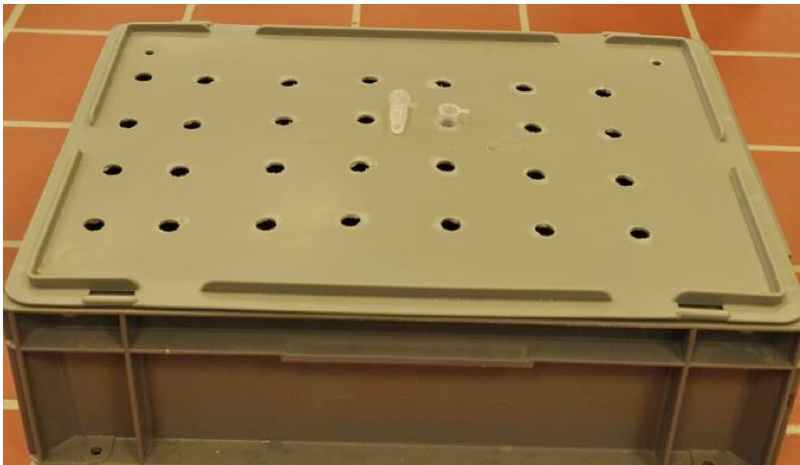 Insert the Eppendorf-type tubes with homogeneous plantlets (at fully expanded cotyledon stage with active root growth) into the cover holes allowing the contact of the cut end with the nutrient solution (Figure 5). Maintain plants in growth chambers at 25/18 °C in a 16/8 h light/dark photoperiod (200 μmol photon m-2 s-1) during the experiment. After 3-4 weeks, when plants have three-four leaves (Figure 6), an aliquot of the salt stock solution (see Recipes) is added to the nutrient solution to obtain the desired salt concentration (see Representative data). The plants cultured in the containers with non-saline nutrient solution are used as the controls. Eight to 12 plants are used for each condition and genotype. Plant biomass (dry and fresh weight) can be measured after 10-15 days to determine the effect of salinity. Roots and shoots are separated and fresh weights are weighed on a precision balance. Dry weights are recorded after keeping the material for 48 h at 60 °C. Figure 6. Tomato plantlets (30-40 days old) growing in the containers. View of A) shoots and B) roots. It has been described that 75-100 mM NaCl significantly reduces growth in several tomato cultivars (Nebauer et al., 2013 and references herein; Corrales et al., 2014). In Figure 7, the representative data obtained in the RAF tomato cultivar are shown. Smaller amounts (50-75 mM) of MgCl2, MgSO4 and Na2SO4 accomplished similar reductions, and higher toxicity was found with magnesium. A representative video of the protocol is also available. Non-saline nutrient solution (control medium) is based on Hoagland no.2 solution (Hoagland and Arnon, 1950). An aliquot of the salt stock solutions is added to the control media to prepare saline media. We gratefully acknowledge funding through grants from the Instituto Nacional de Investigación y Tecnología Agraria y Alimentaria (INIA; project numbers: 2009-0004-C01, 2012-0008-C01) and the Spanish Ministry of Science and Innovation (project numbers: BIO2010-14871 and ERA-NET GEN2006-27772-C2-2). Hoagland, D. R. and Arnon, D. I. (1950). The water-culture method for growing plants without soil. Circular. California Agricultural Experiment Station 347 (2nd edit). Nebauer, S. G., Sanchez, M., Martinez, L., Lluch, Y., Renau-Morata, B. and Molina, R. V. (2013). Differences in photosynthetic performance and its correlation with growth among tomato cultivars in response to different salts. Plant Physiol Biochem 63: 61-69. How to cite: Renau-Morata, B., Sánchez-Perales, M., Medina, J., Molina, R. V., Corrales, R., Carrillo, L., Fernández-Nohales, P., Marqués, J., Pollmann, S., Vicente-Carbajosa, J., Granell, A. and Nebauer, S. G. (2014). Salinity Assay in Tomato. Bio-protocol 4(16): e1215. DOI: 10.21769/BioProtoc.1215.